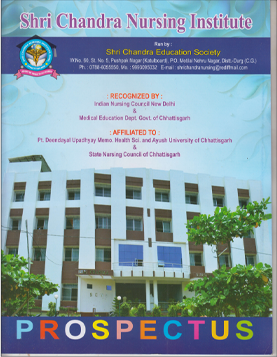 Many Reasons why Shri Chandra Nursing College has become best nursing college of Chhattisgarh. 1. Is Shri Chandra Nursing Institute, Durg recognized by competent authority? Shri Chandra Nursing Institute, Durg is affiliated to Pt. Deendayal Upadhyay Memo. Health Science and Ayush University of Chhattisgarh and recognized by the State Nursing Council, Raipur,Chhatttisgarh and Indian Nursing Council, New Delhi, with due permission from the Government of Chhattisgarh, regarding it’s purpose of providing and promoting nursing education. 2. What are the courses offered by Shri Chandra Nursing Institute, Durg? At present Shri Chandra Nursing Institute, Durg offers Basic B.Sc. Nursing 4 years Degree course, Post Basic B.Sc Nursing(2 years Degree course) , General Nursing & Midwifery (3 years Diploma) course, Paramedical Technician Courses(1 year) on Pathology, Operation Theatre, X-Ray, Para Opthalmic Asstt., ECG & ICCU and Ortho Dressure. On successful completion of UG course, our students receive the Nursing degree, from Govt. of Chhattisgarh. 3. How do I contact Shri Chandra Nursing Institute, Durg? To communicate to the College authorities, then use following telephone nos. 4. What is the admission criteria for Basic B.Sc Nursing, Post Basic B.Sc Nursing , General Nursing & Midwifery courses at Shri Chandra Nursing Institute, Durg? Selection of the UG candidates will be based on the merit of the common entrance examination held by VYAPAM . The admission forms are normally available in the month of February onwards. The admission advertisements are released in the Regional Newspapers, where all the admission details are given. 5. Why should I select Shri Chandra Nursing Institute, Durg for my study? Students of this institute have a unique opportunity to gain practical experience in C.C.M. Medical College, Kachandur, Durg, C.G. with an Govt. District hospital at Durg, C.G.. Not all nursing institutes can provide you such facilities. There is needs hundreds of well trained nurses, therefore It is likely today you are a nursing student in Shri Chandra Nursing Institute, Durg tomorrow you can be a successful nurse at any world class Hospital. 6. Do you analyze the performance of students? Do you help weaker students? Yes. At Shri Chandra Nursing Institute, Durg we understand that student can be made sharp with proper grooming and environmet. This belief has leaded us to develop our mentoring system at the intitute. Our students are permitted to meet their teacher to discuss their doubts. Performance feedback to our students is given periodically and in most encouraging manner. The results are visible, students are enjoying their lectures, class attendance is at peak and overall performances of the batch have improved. 7. I have not succeeded in medical entrance tests. Can I opt for nursing? The next best alternative to opt for is, Nursing. Your background in biology and chemistry subjects will be of immense help to you. It takes 4 years to complete a degree course in nursing. Secondly, to complete this course it does not cost you as much as the medicine course. Start earning as early as when you are only 21 years old. 8. What does a nurse do? Is the job profile really good? 9. What characteristics a nurse should have? 10. What are the career opportunities for me in nursing? 11. Is it true that nursing candidates are in heavy demand abroad? Can I go abroad after completing Basic B.Sc Nursing, Post Basic B.Sc Nursing & General Nursing & Midwifery (GNM) ? 12 What are the job opportunities for Nursing students? Nursing students are eligible for Government Jobs, Teaching staff in Nursing Colleges, Railway/Army and other Nursing staff in Industries, Hospital Nursing Staff.